An outstanding offering of rare Australian Commonwealth stamps will be auctioned in London later this year. The "Morgan" collection will be offered at auction by Spink London, on November 13/14, 2012. Spink say the stamps are estimated to sell for in excess of £3 million. This famous collection was created here by William Morgan, and continued by his well-known industrialist son, Hugh Morgan AC. Major Australian auction houses were of course keen to secure the property, and I feel sure some interesting discussions took place in the “tendering” process! There will be some empty - or at least denuded pockets by mid November, as another big sale takes place here just before. Phoenix Auctions in Melbourne will offer the first section, of the also multi-million dollar Stuart Hardy “Australia”, a week or so earlier. 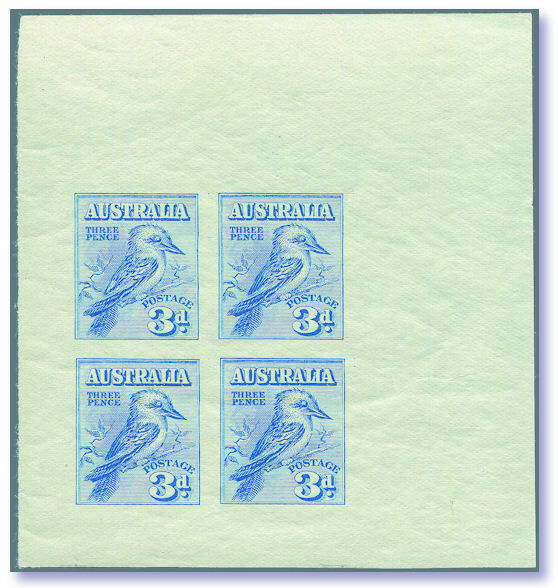 The Imperforate 1928 Kookaburra miniature sheet shown nearby is expected to sell then for around $250,000. My guess is around $300,000 will be the likely invoice price of this sheet, easily creating an Australian price record for a single item. It is the only copy known in private hands, and several collectors “must” own it, so sparks will fly. More on that sale next month. Consigning to Britain 6 months before a sale, exposes any seller to serious foreign exchange risks in these volatile times. Arthur Gray exhibited stellar vision sending his Kangaroos to New York in 2007, when the Greenbacks he got were worth 30% more than they are now. The $A7.15 million that just his Roo stamps were invoiced for, was a dream result. I attended that sale, and still have many of my purchases sitting in a drawer …. OUCH! Wish I could pay the $US account for them today. If there is a financial crisis in Europe, Sterling will be impacted far more than the $A, so the results of this sale will be interesting to see. A weak Sterling will mean less dollars in the seller’s pocket one imagines. Mr Morgan was paid several MILLION dollars a year at WMC, so I guess exchange rate movements are not going to change his lifestyle too greatly either way! Nick Startup, stamp specialist at Spink UK, said today: "We are delighted to have the opportunity to offer such a unique and exceptional collection." The collection is very strong in the pre Kangaroo essays and trials and proofs etc - some of which are unique. During the development of the Kangaroo and Map design, a series of essays were produced. One of them is a horizontal design showing the kangaroo on a map of Australia, flanked by draped flags. 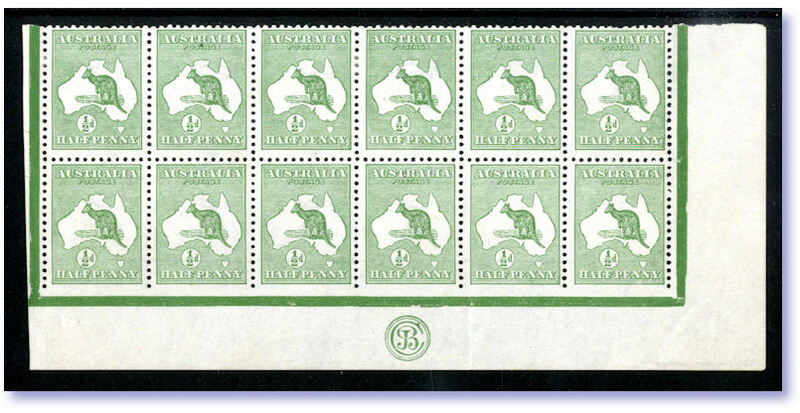 Only eight known examples are recorded, of which five are in the National Philatelic collection of Australia Post. The Hugh Morgan collection has the unique 2½d essay, printed in blue. 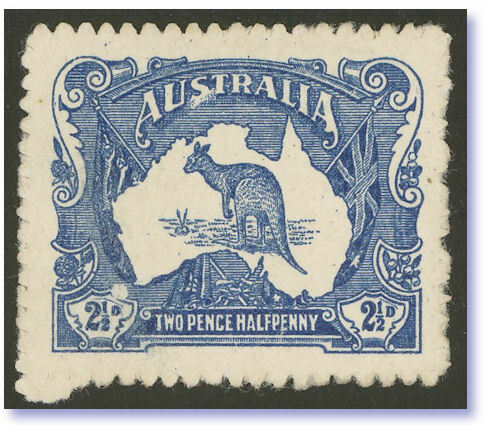 This 1912 un-adopted essay for Australia's first Kangaroo and Map stamp issue was auctioned April 22, 2006 for $A174,750, bought by Morgan. 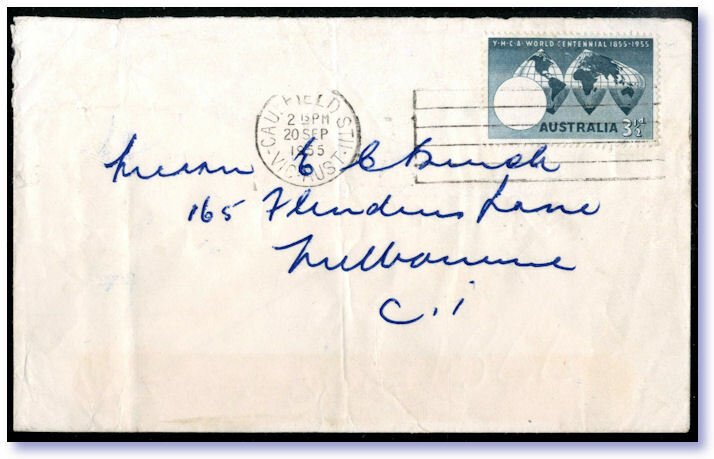 In US dollars at least, it was a record price, for any Australian stamp item, essay or proof. My research indicates that was indeed a world record price for a single stamp essay, from ANY country. That 2006 auction result was obtained by Prestige Philately in Melbourne. The essay in bright blue, is on thick ungummed unwatermarked paper roughly rouletted percé en scie, gauging 14½. Morgan’s collection contains many rare issued stamps of the Kangaroo series, including a multitude of the “JBC” and “CA” monograms, plus the various imprints. The similar Baillie ‘CA’ block of 12 was invoiced for $A74,500 in July 2005 as a relevant guide. The Gray CA monogram block of 6 sold for near $A50,000 in 2007. 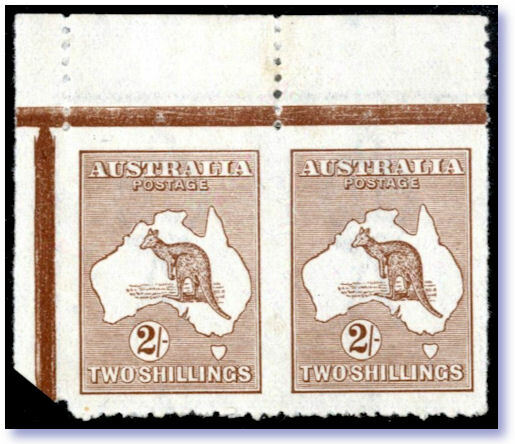 Two other “JBC” Blocks are recorded, neither in private hands – one in the Royal Collection, and the other in Vickery Collection, and hence was absent from the Gray Kangaroos. There is a used example of this ½d stamp with sideways watermark, and a striking 3d “JBC” monogram block of four - imperforate on three sides. Highlights of the Third Watermark include the 2½d missing “1” of fraction perforated ‘OS’, a 2/- pair imperforate on three sides, and a £2 block of four with Harrison imprint. The 2/- Brown pair is FAR superior in appearance to the Gray pair which was torn roughly, and badly creased, but invoiced for near $A100,000. This pair getting well over $A100,000 would not surprise me at all, if condition of the reverse is OK. SG 71a - £70,000. The other 2 existing pairs are in the Royal Collection and Australia Post collections, so are permanently off the market. King George V Heads include Perkins Bacon Die Proofs in First, Second and Fourth States. Another die proof in the collection is the 1/4d, in the issued Turquoise colour shown nearby. Ancient ACSC is $50,000. Little is known of the unusual “RECORDS MELBOURNE” oval cancel, or its usual purpose. I have it on some Kangaroo blocks, and discussion on stampboards.com has unearthed several other examples on issued stamps. Of particular note is the CofA watermark 2d red KGV, with inverted “OS” overprint. 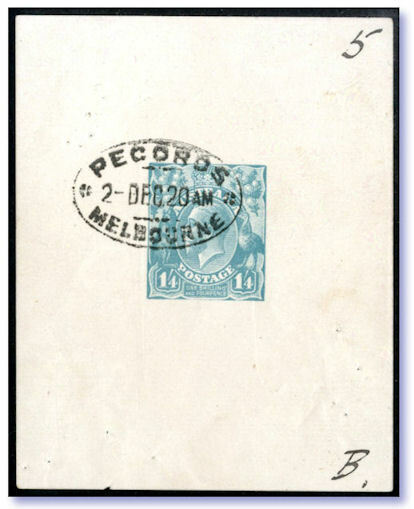 On a large 1933 cover front from Ardelethan NSW. Three examples of this error are recorded, but this is the only example known on entire. The error is illustrated nearby with the close-up detail of the error shown. And probably for the first time anywhere, is published in colour? King George VI issues in the Morgan collection include a range of multiples showing plate numbers. These plate numbers were intended to be trimmed prior to issue, therefore they survive only as a result of mis-guillotining, or because of paper folds during printing, and represent major rarities of the reign. Queen Elizabeth issues in the Morgan collection include some the rarest and most important errors of this period. 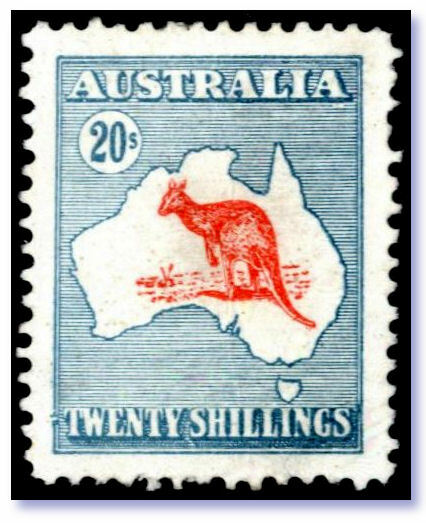 The first missing colour to occur on an Australian stamp, was the 1955 Y.M.C.A. commemorative, with the red triangle omitted. The triangle was added as a second operation by typography. 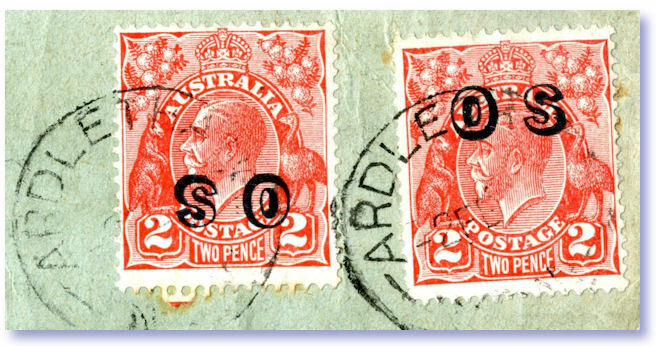 Two examples were discovered soon after issue, one mint, and the other used on cover cancelled at Caulfield South, Victoria. This cover did not appear on the philatelic market until 1970, when it was purchased for the Morgan collection. Photo nearby of this piece is also probably the first time this cover has ever been illustrated in colour. ACSC notes this cover is “defective” and values it at only $5,000. I’ll bet a stack of WMC Shares it will be invoiced for MUCH more than $A5,000! It can think of 2 potential buyers who will not be happily outbid on this. Apart from this cover, only a mint single exists, and SG oddly price only that, not the used example – SG 286a, £16,000. $5,000 - in your DREAMS! In the Decimal period, numerous missing colours are to be found in the collection, particularly among the 1966 definitives. This outstanding holding was assembled over two generations - by William Morgan, and his son Hugh Morgan AC, who together formed a collection of international importance. Hugh Morgan’s interest in stamp collecting began in early childhood, but with the inheritance of his father’s collection, Australian Commonwealth became the focus of his interest. Hugh Matheson Morgan (born 1940) followed his father into the Western Mining Corporation, and was CEO of the massive company between 1990 and 2003. He also served as President of the Business Council of Australia, and was a member of the Board of the Reserve Bank of Australia for 14 years, and many other boards. Morgan chose initially to concentrate on the decimal issues, so as to complement the existing collection left by his father. He determined 1972 as a cut-off date, this being the date of his father’s death and also a protest against what he saw as an unnecessary proliferation of new issues. Due to business commitments, little was added until the mid 1980s, but from 1989, with the assistance of a curator, Tom Carter, selective acquisitions were made. This coincided with a decision to exhibit the collection, which involved the remounting of a large portion of the collection under Tom Carter’s guidance. We are all guilty of making typos of course – me included, but most do not have the global circulation of this one! 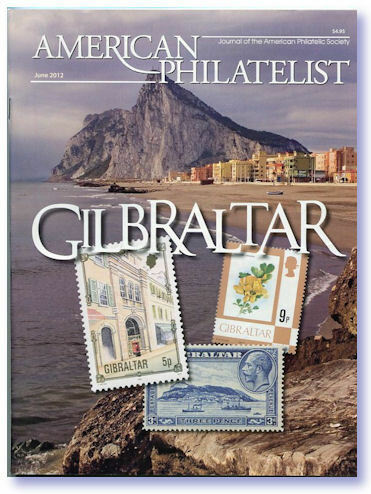 The most recent edition of the “American Philatelist” had the stamps of Gibraltar featured on the front cover. This is a wide circulation magazine - being the official journal of the American Philatelic Society, which has 10,000s of members, me included. Only problem was the Editor using the mis-spelling “GiLbraltar” on his cover – in HUGE letters as you can see. I’ve edited and published stamps and coin magazines, and can empathise with them! I recall once leaving the wrong month on a front cover i.e. the “July” edition occurred twice that year, but nothing much worse luckily. Anyway all reading that magazine collect stamp connected “errors” if they find them free, and this is one it seems sure! In years to come dealers will be buying collector estates, and they’ll have just one copy of the “American Philatelist” in there - the June 2012 one. One story I have followed with great interest in recent years is the discovery of a part cover bearing 3 x SG 1d Plate stamps. 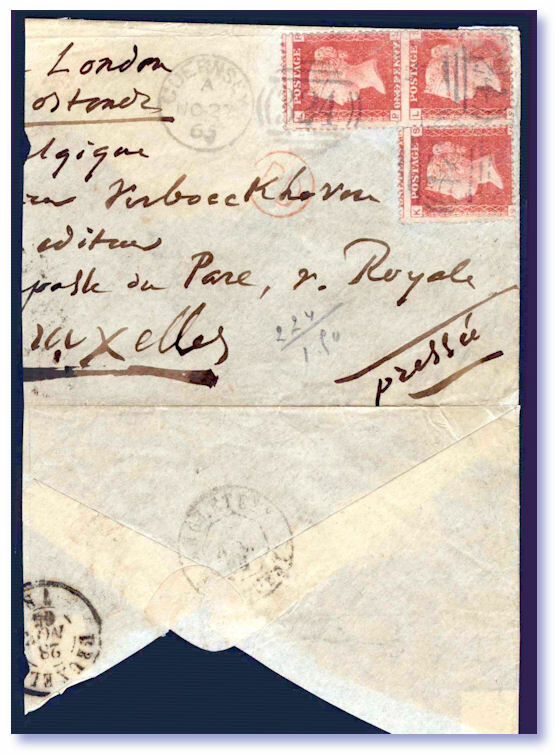 The discovery was of a 1865 part cover from Guernsey, to Brussels Belgium. It was found in an old collection job lot in Europe, where the scarce plate number had not been recognised. Part of the “Mystery Cover”. The part cover was pre-paid with 3 x 1d Red stamps, all dreadfully centred, with the Guernsey "324" barred numeral obliterator. One of those is very badly scuffed, and one is creased. A rather ugly piece, value in normal circumstances – a dollar or so on a good day. However all stamps are showing Plate “77” on both sides – making this literally a £100,000s rarity, when finally certified genuine. Indeed arguably a 7 figure piece, based on the SG recent sale of £550,000 for a single off centred stamp. No forger would have worked tirelessly on 3 stamps, when 1 was normal, and choosing a ratty part cover with damaged stamps is not any forger’s path. Stampboards has many 100s of detailed colour photos, and charts and graphs, large microscope blow ups, and the whereabouts of the other known existing plate “77’ examples. All added to and discussed, by members all over the globe. The photo nearby shows a massive blow up of part of one of the 7s where every individual paper fibre is visible, and are clearly unbroken and unpainted. 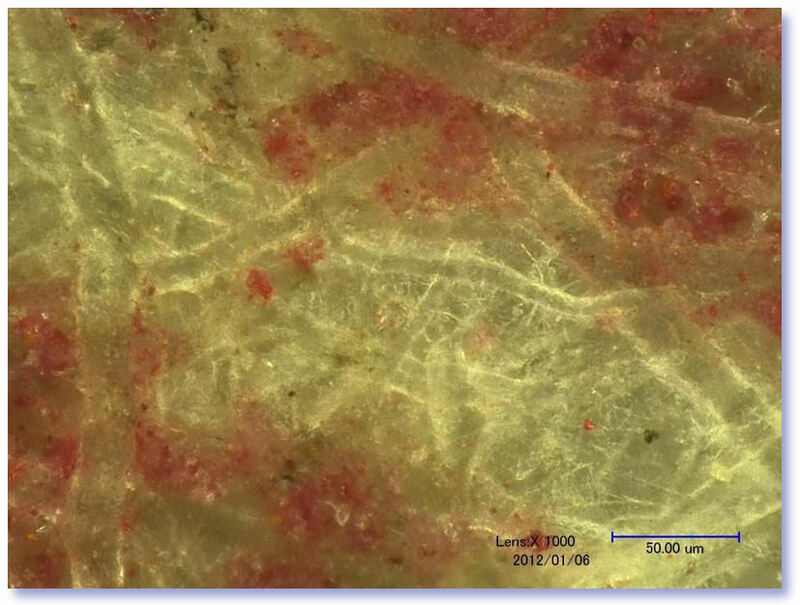 Using a $40,000 Keyence VHX-600E digital microscope. The “white” of the 7 of course being the natural unprinted paper we see. The RPSL claimed that new 7s had been glued on, and the PF in NYC claimed the 7s were all painted in. Talk about Amateur Hour in STEREO! Both utter nonsensical views it seems to me, and to many others who have studied the matter. And both totally discredited on all counts, in a detailed report by a leading forensic document and ink examiner - tinyurl.com/77Radley – a fascinating read. And a Ph.D University Professor’s report, who also examined it in great detail, using state of the art University apparatus, and agrees in writing no tampering or faking took place. tinyurl.com/plate77 caries the complete discussion on this cover, which to date is some 2,200 different messages, with over 60,000 page views thus far. Recently the owner, via neat detective work, discovered the cover was hand addressed by Victor Hugo - the famous French novelist etc, who wrote “Les Misérables” and ”The Hunchback of Notre-Dame”. Hugo was the most famous resident ever of Guernsey, and the cover was addressed in Hugo’s hand to his publisher in Brussels. 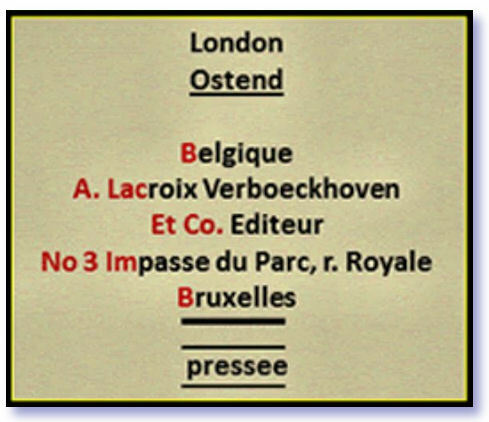 Lacroix Verboekhoven's offices were at Impasse du Parc, Rue Royal, Brussels. Exactly as shown on the cover. Yet another un-expected twist in this quite amazing story! A high-resolution image of the cover was sent to Sotheby’s in Paris for an opinion on the handwriting. Check tinyurl.com/plate77 for all the details, but the saga continues. Get my regular market update emails FREE. The home of - Rare Stamps. Postage Stamp Rarities. Scarce and Unique world postage stamps. All time Philatelic Classics. Scarce Postal History. Stamp Errors, Stamp Varieties, Stamp Freaks, Stamp Missing Colours and Stamp Imperforates, Stamp Investments, Stamp Classics, and Stamp Collections at bargain prices. Bookmark THIS page and you'll very likely see them offered here eventually! Search all my 300+ web pages! Simply type in what you are looking for. "Penny Black", "Latvia", "Imprints", "Morocco", "Fungi" "Year Books", etc! Using quotes ( " ) is more accurf used with no quotes. Search is NOT case sensitive. Tip - keep the search word singular - "Machin" yields far more matches than "Machins" etc.